I spent a total of six nights in Dublin, and as such I actually rested my pretty head in two different places. Both places offered something quite different, but both were also nice stays. I will start off with the review of the first place I stayed at, Kinlay House Hostel. One of the dorm rooms at Kinlay House. I stumbled into Kinlay House early in the am after an overnight flight on which I didn’t sleep, so I’ll give the staff who welcomed me quite unenthusiastically a break since I may just have been grumpy; they were really pleasant beyond that morning. At the end of the day, I was really happy with my stay there. Other than some internet issues, I felt like the hostel formed into a nice little community. They way it was set up was very conducive to meeting new people. The rooms, for a change, were not bunk beds but single beds simply laid out. I liked not having someone above or below me, but I wish there was a little more space for luggage. Personally, I would have liked it they took out one of the beds in the room and put a set of luggage lockers in its place. There simply wasn’t anywhere in the rooms to lock things up, and as someone who packs about $4,000 worth of electronics I’d like to know they are safe. Internet: There was wifi internet throughout the hostel, and it was free. There were also a number of desktops available. My only issue was that the internet was really slow, and got worse based on if the time of day was busy. I also had to keep accepting terms of internet use which was really annoying. Still, as someone who generally works at about 6-8am before others jump on the internet I wasn’t too bothered. Food: There was breakfast available which is always a plus. The best part was though that they also had free meals about 4 nights a week. Free pasta, pizza and pancake nights made it really easy to meet people. It also made it really easy to save money in a city that is not cheap. There is also free tea and coffee all day. Kitchen: The kitchen here is perfect. It has about 3 stoves, 3 ovens and 2 sinks. You wont spend your night waiting to cook. The facilities in the kitchen are top notch. 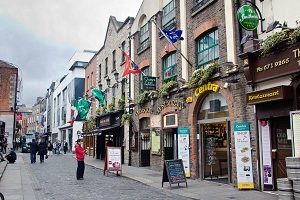 Activities: In Dublin most of the tours collaborate among the hostels, so your not going to have to stress about organizing these. There are always people. You wont find a hostel with a better location. 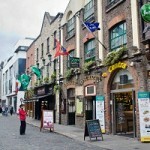 Just outside of the party district of Temple Bar and in a part of the city full of museums, castles, and churches. You wont have to walk far to get anywhere. It is also right on the main bus link from the airport making it easy to get to. I would stay here again, and I would also recommend it to nearly everyone. I think the combination of the location, the free food, and the comfortable surroundings makes it an easy choice. And that brings us to the second place I stayed, the Avalon House Hostel. Avalon Hostel is as classic a hostel as exists in the world. It is very clean, has nice dorms and common areas and the staff is extremly friendly. However, there is nothing that will blow you away about this property. It is big, busy, and fairly standard. Still, you could certainly do worse than staying here. No frills, no gimmicks, just a classic European hostel. I felt like the rooms were a little bit on the small side. I was in a six bed dorm and there just wasn’t a whole lot of space. I was in with a group of guys from England who weren’t packing much gear, but if there were 6 backpackers in the room it would have been a bit of a mess. Still, the rooms were clean and the beds were comfortable. Internet: The hostel has wifi that runs in the main lobby (although it didn’t make it to my room), which is free and fast. There are also a couple of computers, but maybe not as many as a hostel of this size should have. Kitchen: There is a great kitchen with about 3 sinks and stoves. There is an adjacent coffee shop, and breakfast is included. Hang out spots: The hostel has a pool table and a couple other chill out spots. Activities: As is the case with Kinlay, most of the tours are done through joint tour companies. The hostel does a good job of letting you know what is available. Any inquires about anything are easily answered by the desk. In comparison to Kinlay House, the location of Avalon House is not good. However, it is all relative. Everything in Dublin is quite close so it doesn’t really make for an issue. You can walk to Temple Bar in about 5-10 minutes. You are right near a bunch of great little parks though which is a plus. If you’re looking to stay in a quieter part of town this is a good location. Again, what’s with the lack of lockers? All they have to do is build them under the beds. The can say it’s safe all they want but I want reassurance via a padlock or them paying for anything stolen since there are no lockers. The location could definitely be better. Personally, I’d stay at Kinlay House over Avalon for a couple reasons. 1) The location is better. 2) The free food a couple times of week. 3) It’s more of a community feel over at Kinlay. Still, you could do much worse than staying here. And for 5 Euros Sam, you can! I don’t understand how churches can justify entry fees like that. It hurts. After visiting the beautiful Kinlay House in Galway, I thought the one in Dublin would be a good bet. Wrong! There’s not one desk person working there who’s from Ireland. For good reason, they need people who treat their guests with the utmost disdain – a habit we Irish don’t practise (An exception is the cranky Irish lady in the kitchen, who’s there to give you a dirty look at breakfast time.). Second, apparently, making money is the number one priority in this hostile hostel. Guests are secondary even though they pay for this place’s existence. The outside of the building is quite nice. But when you get inside the first thing you experience is ovecrowding. If you’re not in your bed-stuffed room, you can go into the backpacker-stuffed common room. The owner didn’t think that poor people are worth any dignity when he designed this kip. The poor are meant to be punished. And punishment is what you get – from all directions. Third, granted the building is old, the help seem to have little regard for cleanliness. Fourth, the creaky stairs need to be replaced, or at least repaired and refinished. Hahahah, this review made me laugh, mate! Truly class! haha. I’m in tears. Thanks for the update, I really appreciate the info and I’m sure readers will too.